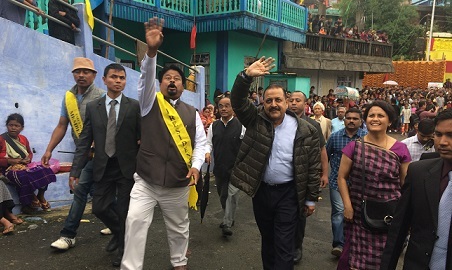 Union Minister for Development of North Eastern Region (DoNER), Jitendra Singh attended the four-day annual cultural festival, ‘Behdieñkhlam’ in Meghalaya’s Jaiñtia Hills which concluded on Tuesday. The festival is held every year at Jowai town, the headquarters of West Jaiñtia Hills district. Thousands of men, both young and old danced together in muddy water of Pung Aitnar on the concluding day of the festival of the Jaiñtia tribe. Behdienkhlam is celebrated in the month of July for good health, property and bumper harvest. The Union minister spent time with visitors from across the region, who came to witness the festival. 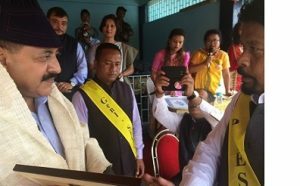 Singh said that his presence at the event was a reiteration of the high priority that Prime Minister Narendra Modi and the NDA Government accord not only to the development of the Northeast but also to promote, preserve and patronize the healthy traditional culture and civilization of the region. The DoNER Minister said that Prime Minister has visited the Northeast over 30 times in a short span of four years. Stating that the Government has sought to identify every ethnic and tribal group of the region, Singh said that Ministry of DoNER has introduced the practice of having a rotational Camp Secretariat every month in each of the eight States and this has resulted in a very close affinity between the people of Northeast and the Ministry of DoNER. “During the tenure of our Government, Meghalaya has seen its first-ever train and got included in the rail map of India. Not only this, in the last four years, the law and order and security situation has considerably improved towards normalcy. Now, the picturesque locales of Meghalaya are flooded with tourists,” he said. In his welcome address, OR Challam, president, Seiñraij Jowai, thanked the DoNER Minister for attending the four-day festival which has very strong, emotional, sentimental, cultural and spiritual importance for the people of the region.